About 52ha of the Park - over 25% of the area of dry land - was densely infested with non-native species of shrubs at the start of the program in 2009. Since then ~8500 Peking cotoneaster (Cotoneaster acutifolius) and 3100 Tartarian honeysuckle (Lonicera tatarica) have been removed and countless European mountain ash (Sorbus aucuparia) seedlings pulled up . In the next 5 years we will focus on removal of the remaining dense patches of these plants, checking cleared areas for missed plants, and preventing cleared areas being recolonised by non-native invasive species. Our objective in the next 5 years is to reduce the abundance of these species to a level where they have a negligible impact on the biodiversity and ecosystem function of the Weaselhead.. 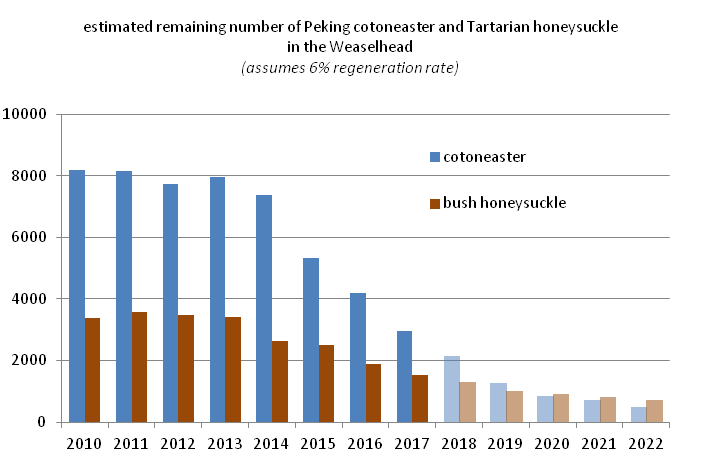 Monitoring of weeded areasover the last 6 years shows native vegetation to be recovering well in the floodplain and filling in the gaps left by removing these species (details here). Monitoring of recovery along the escarpments has started and results are expected in 2019..
Every year volunteers have removed flowers and seeds from species such as yellow clematis (Clematis tangutica) and creeping bellflower (Campanula rapunculoides) that cannot be simply dug up as the roots are too deep or break and regrow. So far this seems to have prevented these species spreading, and no new colonies have established since the Program started. It is hoped that in the future a more permanent method of control will be found. In 2015 spotted knapweed (Centaurea maculosa) was first found in the Weaselhead with colonies found on almost all of the gravel banks along the river. Extensive searches were made in 2016 when 43kg of plants were removed and again in 2017 when 36kg were removed. We are still hoping that we can prevent this species permanently establishing in the Weaselhead. Other species that cannot be removed manually such as common buckthorn (Rhamnus cathartica) or European barberry (Berberis vulgaris) are being treated by the City of Calgary with herbicide or, in the case of leafy spurge (Euphorbia esula) - an extremely invasive herbaceous species - with a bio-control agent.